Arne Jacobsen is one of the most influential Danish architects and designers of the 20th century. In the way of his 50 year career, his name became a synonym for the Danish modernism. The special mark of a designer, the clear, almost purist shape, is cognizable in all of his designs, it doesn't matter if its buildings, furniture, accessories, textiles or lighting. Arne Jacobsens designs can be understood as inspiring lesson in geometry, which is manifested in their reduced shapes. To that came an unique safe feeling for proportions. He used a harmonic arrangement of lines, angles, circles and cylinders, he wanted to express visual harmony and calmness and banished consequently every attachment. He also insists on colourful demureness and worked especially with soft nuances and shades, attracted the small attention on him. His credo: an object should not catch someone’s eye or attract with the experiences of the viewer. For interior design accessories applied the same as for a building - Furniture and ambience of a room have to be understood as package. The lamp series AJ is the perfect appearance of the purist lines by Arne Jacobsen. The lamps were designed for the Radisson Blu Royal Hotel, the once SAS Royal Hotel in Copenhagen in 1960. Its asymmetric cone shape caters for a clear borderline of the light. Or: you can imagine the light, before the lamp is turned on, because the way in the design has already been forced. The shade is adjustable, the light follows the shape. The AJ lamp family enjoyed great popularity from the beginning at the architects and design lovers. It stands in the centre of the common presentation by Louis Poulsen and the Radisson Blu Royal Hotel; because the lamps and also the hotel celebrate their 50th birthday this year. 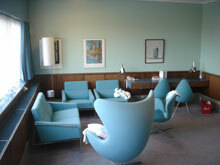 Another birthday child: the armchair the Swan and the Egg by Arne Jacobsen. "While searching for a colourful inspiration, we approached the furniture manufacturer Fritz Hansen, who showed us examples of the colour plate by Arne Jacobsen, and also original fabric examples of the Swan and the Egg", said Claus Østergaard, International Marketing Manager at Louis Poulsen. "Arne Jacobsen confronted strong colours to reserved ones. He used fabrics for his drapes, which filter the daylight which caters for a clam, soft light in the room. We tested the colours by Fritz Hansen and chose five of them which would harmonise with every interior design accessory. You will also find this colours in textiles, which were designed by Arne Jacobsen, and also in the water colours, which he sketched in his leisure time", added Claus Østergaard. Participated in the project, to present lamps in the hotel is Pia Knudsen, Business Area Manager for the category Residential at Louis Poulsen. Pia Knudsen commented that Louis Poulsen "often tried to create this lamp family in different materials and with different materials and with other surfaces, but he was never content with the solution. We still have the colours clack, white, and graphite and also the silky matt, elegant surface. Shine would be totally failed. It needs many processes, to get the wished soft, refined appearance for the table-, floor- and wall lamp of the AJ Series." The five new colours are matte pastel tones, which got their name from the rooms, in which they can be seen in the Radisson Blu Royal in Copenhagen from March 1st 2010. Chosen were refurnished double rooms and suites in the 18th floor of the hotel, whose colourful design harmonized best with the colours of the lamps. The guests can chose their favourite colour in the rooms 1805, 1806, 1808, 1809 or 1810 and spend the night encircled by the ambience of a very special designer. The new director of the Radisson Blu Royal Hotel, Roy Al Kappenberger, was born in the 18th floor of the Hotel. Roy Al Kappenberger is the son of the Swiss hotel director Alberto Kappenberger, with who Arne Jacobsen worked together in the building phase. He reminded himself how he walked around in the uniform of the learner in the hotel, when he was a child and also off the many famous guests which used to live in the first designer hotel of the world: Members of the royal dynasty, top-ranking politicians, actors and rock stars. "Arne Jacobsen was a visionary. A genius, who was far ahead of the time", says Kappenberger. From the design of the building with the peppy spiral stairs and the famous armchairs, the Swan and the Egg, up to many details of the interior design like dressers, doorknobs and stainless steel cutlery - Arne Jacobsen showed, what exactly branding is and added a totally new visual appearance to the design world. And he defined the word luxury totally new. Instead of pompous, magnificent and snobbish, now inconspicuous-artful elegance is introduced. 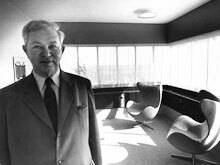 Like Roy Al Kappenberger explains: "Arne Jacobsen impressed the design-DNA of our hotels like no other. It is close to my heart, to continue his design line." From the overall 275 rooms, the room 606 is still in the original condition. Here the time stands still, here Arne Jacobsens aesthetic still convinces.